If you haven't played at Intertops Poker a special freeroll tournament this weekend is definitely the time to give it a try! They're giving away tickets for this weekend’s $2000 Revolution Freeroll Tournament -- but to new players only. The only catch is that you have to claim your free ticket by this Wednesday, June 20th. 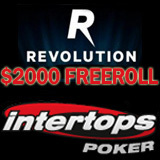 New players that register and make a deposit using the First Deposit Code below will receive a ticket to the $2000 Revolution Freeroll Tournament which takes place this Saturday, June 23rd at 9:00PM ET (June 24th 01:00AM BST) at http://poker.intertops.eu. In addition to the freeroll tournament ticket, the First Deposit Code also entitles players to a 200% deposit bonus (up to $2000, minimum deposit $20). One of the busiest online poker rooms on the Revolution poker network Intertops Poker has been one of the world’s most established and trusted poker sites for nearly ten years. Players choose Intertops for its hassle-free deposits and withdrawals and generous bonus offers.